Published April 24th 2014 by Random house. 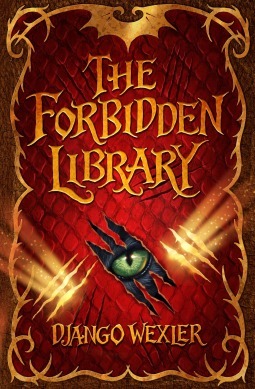 My Review: The Forbidden Library series is bound to be the next big children’s fantasy sensation. The concept was really original and fun- I really recommend this is you’re a fan of The Chronicles of Narnia! As soon as I’d started, I knew I was going to really like it. I was drawn in straight from the start; I really liked the quiet, hard-working protagonist Alice, and felt like crying with her after she finds out about her father. I was really absorbed in the story as she finds herself in a new, strange house with a relative she never knew she had. After enjoying about a third of the book, I don’t know why, but I lost interest a little… I thought maybe I was just in the mood for another genre, so I read a couple of books in-between. It took me a while to get back into the story. I really, really did love the concept and the magical books idea, it was so awesome, but for some reason up until the last hundred pages or so, I found myself just reading and not enjoying it as much as I thought I would. I’m really not sure why! Django Wexler’s writing really is great, it felt so descriptive and fun.I did find bits a little fast paced…. But it’s definitely worth a read, though, if you love fantasy; it ticks all of the boxes. I really liked Alice, for the most of the story. She was a really relatable girl. She’s a bit lonely,but very adventurous. And, of course, she loves reading. 😀 A little way into the story, though, her personality just suddenly seemed to change. She was really… quiet sounding at the start, though very inquisitive, and then once the supporting character is introduced she suddenly seemed a lot different, I can’t quite put a finger on why… she just seemed randomly snappy? I couldn’t quite get my head around it. I’m not sure if that was just because I’d been dipping in and out of the story, though! Overall, The Forbidden Library is definitely worth reading if you love fantasy books. I’m sure it’s going to be the Next Big Series for middle grade readers! I really did love the concept of the story… it’s a book about books, how can you not love that? 😀 Mostly, I was really absorbed in the story. It did take me a long time to read, and I was mixed a little about the protagonist, but I will most definitely be looking out for more from Django Wexler in the future! I received a copy of The Forbidden Library from the publisher, in exchange for a review. In no way at all did this affect my thoughts. This entry was posted in Uncategorized and tagged adventure, books, fantasy, MG on May 16, 2014 by keithbwalters.